We started a new feature here at Comic Impact a few months back ,The ComicImpact Store Spotlight. Every month we will turn our magnifying glass on a local store (local can mean local for you the comic fan as well!). We then contact the owner and ask a few questions and even throw some pictures up on the site!! Sweet! Right? Well wait it gets better. We also decided that every POW(PICK OF THE WEEK) for that month that we record that we will mention the store of that month.. for the entire month! Now here is the important part where you, the reader can get involved. We want to know about your store! We want to know what stores in you area there are that you feel deserve to be spotlighted! Send us some suggestions as well as some reasons why you feel your store deserves it! We will pick from those at the end of the month to get the new store each month!!! This month we’re taking a look at Graham Crackers Comics as they have 9 that’s right 9 store’s located throughout Illinois, with 3 Chicago locations and 6 in the western suburbs of Chicago. 1.Tell us a little bit about your store ? 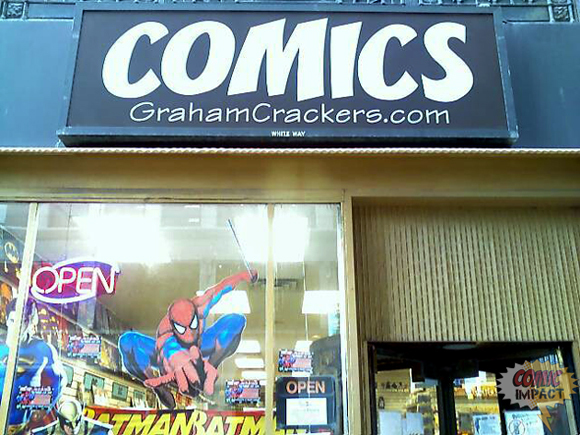 Graham Crackers Comics is a 9 store chain located throughout Illinois, with 3 Chicago locations and 6 in the western suburbs of Chicago, plus a cool on-line shop at GrahamCrackers.com, well at least we like to think it’s cool. 2.How long has your store been open? GCC has been open for over 27 years now. 3. Do you have any special event? ie, Magic the Gathering, Pokemon etc. We hold the usual Magic & Heroclix events throughout our stores, participate in the wildly popular 24 HOUR COMICS day (http://www.grahamcrackers.com/24hourcomicsday.htm) where we stay open all night and host a spot for local artists to try and create an entire comic in just 24 hours. 4.Do you have any special store deals? ie, buy one get one free on a specific day, or a certain % off if you purchase a certain amount ? We have a standard comic pull & hold service for customers to enjoy a 10% discount on the books they pre-order and not have to worry about missing out on their books. It’s free to join and books can be added or dropped on a whim. We’re also currently running FREE COMIC WEDNESDAYS where anyone that comes in the store in the month of FEB/MARCH on a Wednesday can pick out 3 FREE COMICS from select back issue boxes. No purchase necessary. 1 FREE COMIC DAY a year is just not enough! We work very hard to have a 9 store chain benefit customers at each of our own locations. Transfering product between stores twice a week, free WANT LIST request where we check not only all 9 of our stores but check at each of the 25-30 conventions we attend each year across the entire U.S.
5.As a retail store owner what is the most difficult thing that you wish you could change in this industry? It’s changed a lot over the years, but I’m still dumb founded every week when I see a major publisher (be it DC or MARVEL) releasing all of a similar title in the same week. Be it 6 X Titles in 1 week, Mighty Avengers, Dark Avengers & New Avengers all on the same week or how about Batman, Detective, Robin & Nightwing coming out this week. Customers have budgets like most people and asking them to drop $21 bucks in 1 week just because they like X titles sends them the message that ‘Hey, this hobby is expensive – maybe I should quit this’. Spread out 1 or 2 a week and they can justify dropping $6 bucks (I can skip buying lunch on Wednesday) and continue collecting – why in gods name do you continually release multiples of the same character(s) on the same week. ARGGHHHH! 6.How long have you been involved with comics? Stores have been open for over 27 years now, but we were selling at conventions for years before that. 7.How do you feel about CGC and graded books? As a fan are you for or against it? As a retailer do they sell in your store? We’re charter members of CGC (#13!) and proud supporters of the company and idea. I can’t see why someone would be ‘against it’, it’s like being against backer boards. If you don’t like to protect your books, then don’t. It allows a consumer to buy a book with full confidence that it hasn’t been messed with, and for an expensive investment this is a good idea. Though, I wouldn’t recommend it for a $2.99 comic that has no monetary or sentimental value, anymore than I’d recommend using a MYLAR and an ACID-FREE board on that book. We do sell some CGC books throughout the chain but most sell at conventions and via mail order. 8. Where do you see the comic book retail business in five years? I’m hopeful that the industry will still be strong in 5 years, I’m more worried about 20 years from now. 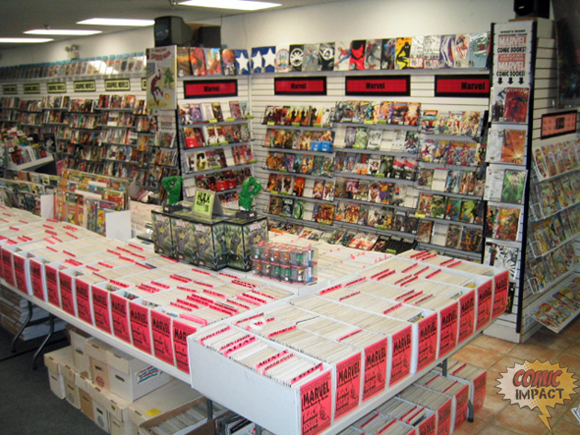 The fate of the comic retail industry is entirely in the hands of the big 2. If DC & MARVEL decide to aggressively pursue digital releases our industry can go away overnight. Doesn’t matter how nice the store is, how great the location is, how deep your back stock. If they stop publishing print editions you can’t get enough customers in the door on a regular basis to stay open. 9. How does your store deal with collectibles such as statues and figures? Is it more of a special request item or is the average fan still interested in them? We stock a variety of statues and action figures at all the stores, just to offer the causal customer the option, but most of the statues sold are sold via special requests. 10.What is the average age of your customers? The suburb stores see more younger kids that can rider their bikes, our stores in college town see (get this) mostly college students, our Chicago Loop locations business professionals, etc. but averaging them all together I can confidently and completely make up the number 28. 11.As a retailer do you still have the luxury of being a fanboy and do you still get giddy when you read your favorite books? I’m pretty sure this is the main reason why so many fanboys become retailers, because we love reading the comics. While you tend to get more cynical over the years, I recently used GIDDY to describe how I feel reading SUPERMAN SECRET ORIGIN. The combination of Johns script and Gary Franks amazing Superman (Christopher Reeve) & Lois Lane (Margot Kidder, but hot) consistently makes me giddy as I turn each page. 12. What is the number one question you get from new customers? How long have you guys been here? When you say new customers that’s the first one that always sticks in my mind. 13. 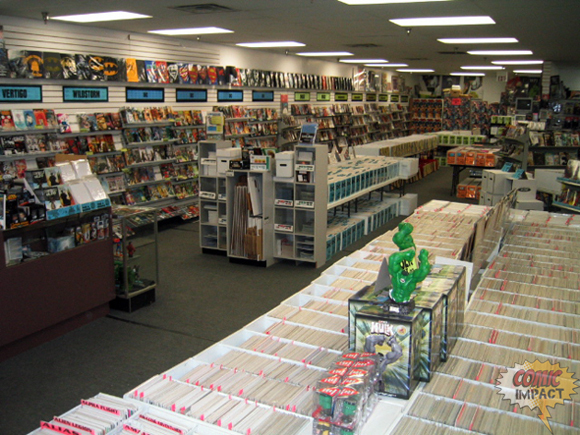 If someone walks into your store and say’s, “Hey, I want to get into comics.” What would you recommend to them? Always answer a question with another question. “What kind of books do you read?” “Have you seen any comic books movies?” “What other kinds of fiction do you like?” I always stick with the what other books do you like, once I’ve got a baseline it’s easy to point them in the right direction. The only one that really makes me freeze is when they tell me they were into bad 90’s comics but got tired of them. I have current titles that I’m passionate about from every genre. We have a 100% money back guarantee on anything any of our managers recommend, so a new customer is never gambling any of their money away on our say so. 14.What are some of your favorite current books? Does it influence sales in your store? Walking Dead, Invincible, Superman Secret Origin, Fables, JL Cry for Justice, Sword (Image), Criminal, the list keeps going. Influences sales in the stores? Absolutely. Each stores manager has his own preferences and when they’re passionate about them with the customers – that store sees higher numbers in all those titles he promotes. 15. What is the best storyline in comics history and what is the one book you never get tired of reading? I have a library of trades that I consistently re-read every 3 years or so, be it Watchmen, Preacher (does any series scream -make me a Cable TV program moreso than this), and my current favorite is Walking Dead. Always a joy to re-read these every few years. I could list 20 or 30 more books/series without a problem.